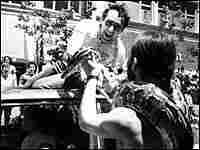 James Franco plays Scott Smith, Harvey Milk's partner, in the biopic Milk. 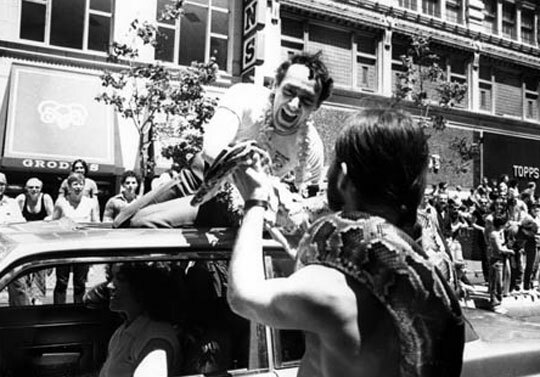 Harvey Milk was a Castro neighborhood activist elected to San Francisco's city government in 1977. He was killed less than a year into his term. Knowing he might be killed, Milk recorded a political "last testament" on audiotape. Hear a portion of it below. In two weeks, the film Milk is going to open. 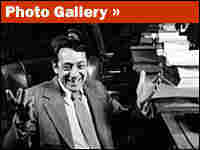 It's about Harvey Milk, who served on San Francisco's Board of Supervisors — the city's equivalent of a city council. In 1978, when he was gunned down by an assassin, he'd been in office less than a year. The first openly gay man to be elected to public office, Milk left a legacy of determined enfranchisement that lives on in the more than 600 openly gay or lesbian elected officials serving now in North America. But especially among younger elected officials, memories of Milk are beginning to fade. "I don't know very much about his life story," admits 35-year-old Patrick Wojahn, who was elected to the city council in College Park, Md., in 2007. "It just shows that all this stuff is many, many years ago and unfortunately not as fresh in our minds as maybe it should be." Wojahn cites gay and lesbian Reps. Barney Frank and Tammy Baldwin as his gay political heroes. He was only 5 years old when Milk was killed. For a younger generation, the Will and Grace generation, it's almost inconceivable that not too long ago, people could get fired or arrested for being gay. The shame sometimes led to suicide. It was in that climate that Milk managed to help successfully beat back Proposition 6 --an initiative that would have barred gay people from working as school teachers — and passed a city ordinance guaranteeing equal rights for gays and lesbians in San Francisco. "You could just see that people stood a little taller," says Walter Caplan, who was Milk's lawyer in the 1970s. "There were always gay teachers, gay nurses, gay health-care people who lived quiet little lives and feared for losing the security of the jobs that they had." Caplan says the ordinance set off a protracted civil-rights chain reaction that perhaps even Milk may not have anticipated. For example, because the airport in San Francisco was owned by the city, suddenly major airlines were required not to discriminate against gays and lesbians. While most of the major airlines long resisted giving domestic-partner benefits, now, Caplan notes wryly, you'll see them aggressively marketing their services to gay consumers at San Francisco's annual pride parade. Anne Kronenberg, who coordinated Milk's campaign, now works as deputy director of San Francisco's department of public health. She says over the course of many years of activism, Milk helped transformed the city's political landscape. "He understood we can't do it by ourselves," Kronenberg says. By working strategically with unions and the city's fragmented ethnic and racial groups, Milk organized minorities to become the majority. She says when Milk was elected, along with a single mom, an African-American woman and a Chinese-American man, the San Francisco city council began to look a lot more like San Francisco. And speaking of resemblances, Kronenberg says she was shocked by how much Milk star Sean Penn looked like her former boss. She worked as an extra during much of the San Francisco shoot. "There were a few times when [Penn] walked by and I'd gulp," she says. Times change, Kronenberg says. There was a period when she would have found it difficult to believe that so many straight Hollywood actors would enthusiastically perform in a major motion picture about a gay activist. And how ironic, she notes, that just as a film commemorating his life is about to be released, the majority of Californians voted to take away key civil rights of their gay and lesbian fellow citizens.